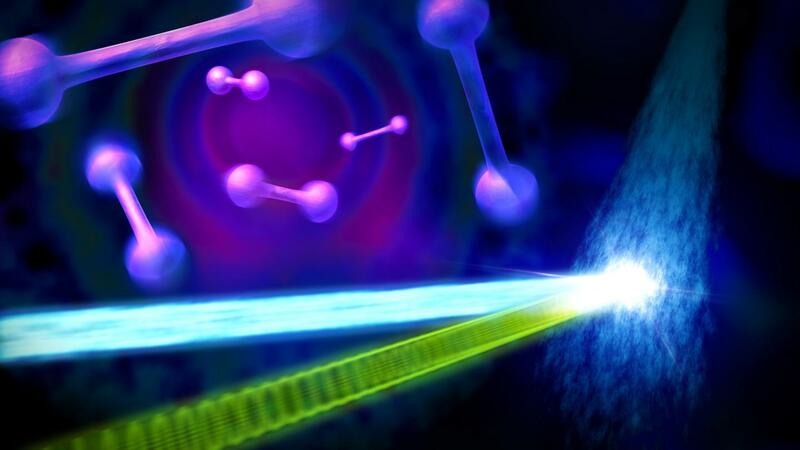 An ultrafast "electron camera" at the Department of Energy's SLAC National Accelerator Laboratory has made the first direct snapshots of atomic nuclei in molecules that are vibrating within millionths of a billionth of a second after being hit by a laser pulse. The method, called ultrafast electron diffraction (UED), could help scientists better understand the role of nuclear motions in light-driven processes that naturally occur on extremely fast timescales. Researchers used the UED instrument's electron beam to look at iodine molecules at different points in time after the laser pulse. By stitching the images together, they obtained a "molecular movie" that shows the molecule vibrating and the bond between the two iodine nuclei stretching almost 50 percent - from 0.27 to 0.39 millionths of a millimeter - before returning to its initial state. One vibrational cycle took about 400 femtoseconds; one femtosecond, or millionth of a billionth of a second, is the time it takes light to travel a small fraction of the width of a human hair. "We've pushed the speed limit of the technique so that we can now see nuclear motions in gases in real time," said co-principal investigator Xijie Wang, SLAC's lead scientist for UED. "This breakthrough creates new opportunities for precise studies of dynamic processes in biology, chemistry and materials science." The UED method has been under development by a number of groups throughout the world since the 1980s. However, the quality of electron beams has only recently become good enough to enable femtosecond studies. SLAC's instrument benefits from a high-energy, ultrabright electron source originally developed for the lab's femtosecond X-ray laser, the Linac Coherent Light Source (LCLS), a DOE Office of Science User Facility. The results will be published in Physical Review Letters. 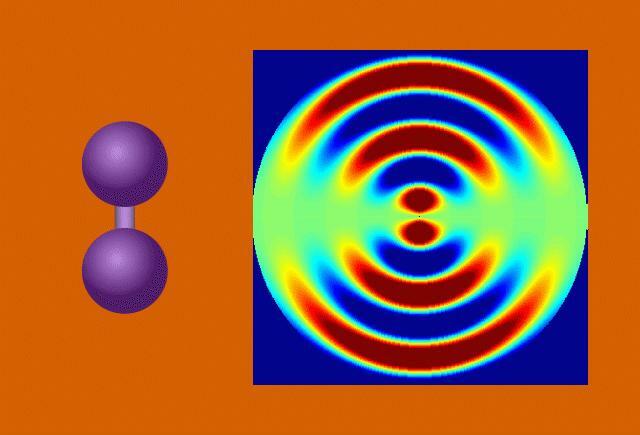 Physicists have long known that chemical bonds between atoms are flexible - like springs connecting spheres. This flexibility allows molecules to change shape in ways that are crucial for biological and chemical functions, such as vision and photosynthesis. However, methods to study these motions on a femtosecond timescale have so far been indirect. Spectroscopy, for example, infers these changes from the way laser light interacts with electron clouds around atomic nuclei, and requires theoretical calculations to turn these data into a picture of the nuclear geometry. This can be done very precisely for small molecules - an accomplishment that earned the late Ahmed Zewail, a pioneer in the field of femtochemistry, the 1999 Nobel Prize in Chemistry - but quickly becomes very challenging for larger molecules. 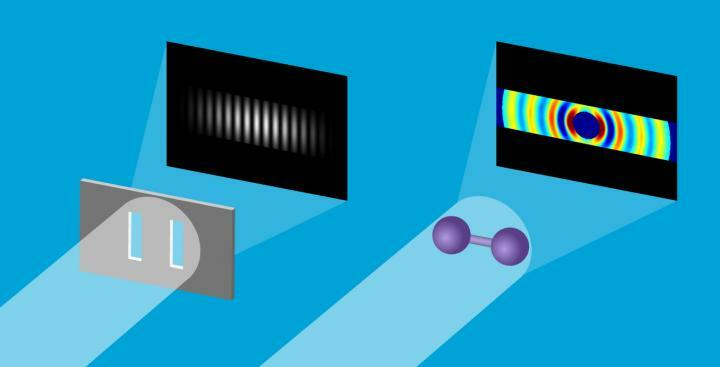 Researchers also use X-rays to study ultrafast molecular motions. Although X-rays deeply penetrate the electron clouds, interacting with the electrons closest to the nuclei, they don't yet do so with high enough resolution to precisely determine the nuclear positions in current femtosecond X-ray studies. In contrast, UED uses a beam of very energetic electrons that interacts with both electrons and atomic nuclei in molecules. Therefore, it can directly probe the nuclear geometry with high resolution. "We previously used the method to look at the rotation of molecules - a motion that doesn't change the nuclear structure," said lead author Jie Yang from SLAC, who was at the University of Nebraska, Lincoln at the time of the study. "Now we have demonstrated that we can also see bond changes due to vibrations." The concept behind the iodine UED experiment is similar to the classical double-slit experiment often demonstrated in physics classrooms. In that experiment, a laser beam passes through a pair of vertical slits, producing an interference pattern of bright and dark areas on a screen. The pattern depends on the distance between the two slits. In the case of UED, an electron beam shines through a gas of iodine molecules, with the distance between the two iodine nuclei in each molecule defining the double slit, and hits a detector instead of a screen. The resulting intensity pattern on the detector is called a diffraction pattern. "The characteristic pattern tells us immediately the distance between the nuclei," said co-principal investigator Markus Guehr from Potsdam University in Germany and the Stanford PULSE Institute. "But we can learn even more. As the iodine molecules vibrate, the diffraction pattern changes, and we can follow the changes in nuclear separation in real time." Co-principal investigator Martin Centurion from the University of Nebraska, Lincoln, said, "What's also great about our method is that it works for every molecule. Unlike other techniques that depend on the ability to calculate the nuclear structure from the original data, which works best for small molecules, we only need to know the properties of our electron beam and experimental setup." Following their first steps using the relatively simple iodine molecule, the team is now planning to expand their studies to molecules with more than two atoms. "The development of UED into a technique that can probe changes in internuclear distances of a dilute gas sample in real time truly is a great achievement," said Jianming Cao, a UED expert from Florida State University and a former member of the Zewail lab at the California Institute of Technology, who was not involved in the study. "This opens the door to studies of atomic-level motions in many systems - structural dynamics that are at the heart of the correlation between structure and function in matter."